From Killebrew, to Cuddyer, to all of us. “I have spent the past decade of my life promoting hospice care and educating people on its benefits. I am very comfortable taking this next step and experiencing the compassionate care that hospice provides. 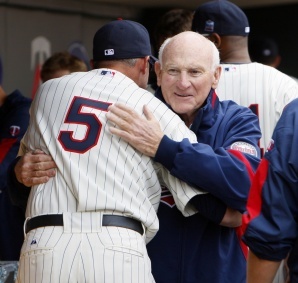 Harmon Killebrew was a hall of famer. He hit 573 home runs, most of them towering blasts. His debut was on June 23, 1954 for the Washington Senators / Minnesota Twins. Harmon’s last game was on September 26, 1975 as a Kansas City Royal. He spent most of his career as a Twin. He is revered in Minnesota, where they’ve named a street after him near the site of the old Metropolitan Stadium. After 22 years of baseball, Harmon has lived for another 36 seasons as a humanitarian. He has raised millions of dollars for leukemia research. And, above all, he is the nicest guy that anyone could meet. Michael Cuddyer, a current Twins star, recalls a time when he and Killebrew were signing autographs for fans. Cuddyer was scratching off an unreadable, sloppy signature. Killebrew noticed. He told Cuddyer that he needed to take more time with each autograph for the fans. Killebrew reminded Cuddyer that most of these fans would only meet him once, and they didn’t want to have an autograph that they couldn’t read. From then on, Cuddyer has carefully and legibly signed his name. Last fall he took the time to sign a bat for one of his greatest admirers, a woman diagnosed with stage 4 cancer. The signature is carefully written and completely legible on the bat Cuddyer gave her. I know this for sure, because that woman is my wife. The lesson that Killebrew taught Cuddyer is a good one for all of us. Most of the encounters we have with others will be brief, but there’s always time for a smile or an encouraging word. Killebrew taught it. Michael Cuddyer will continue Killebrews legacy of friendship, a legacy that all of would do best to pass on to others. 2 Responses to From Killebrew, to Cuddyer, to all of us.